2016 book fairs - International Publishers Association. 2016 International Book Fair Calendar - "World Literary Review." Beijing International Book Fair | BIBF - since 1986. The largest publishing industry event in the Asian Market. Bologna Children's Book Fair | La fiera del libro per ragazzi - "The rights place for children's content." Since 1963, it is held yearly for four days in March or April in Bologna, Italy. It is the meeting place for all professionals involved with creating and publishing children's books, and is mainly used for the buying and selling of rights, both for translations and for derived products like movies or animated series. Brooklyn Book Festival - since 2006. Annual book fair held in Brooklyn, New York. Unlike most book fairs, the Brooklyn Book Festival caters to the adult readership, although they also feature numerous activities and readings for children. The festival includes themed readings, panel discussions, vendors, and author signings. FRANKFURT BOOK FAIR | FRANKFURTER BUCHMESSE - since 1949. World's largest trade fair for books, based on the number of publishing companies represented. Hay Festival of Literature & Arts - since 1988. "Imagine the World." Annual literature festival held in Hay-on-Wye, Powys, Wales, U.K. for ten days from May to June. Described by Bill Clinton in 2001 as "The Woodstock of the mind". HONG KONG BOOK FAIR - since 1990. "Reading The World - The More, The Merrier." Organised by the Hong Kong Trade Development Council, held annually (usually in the middle of July) at the Hong Kong Convention and Exhibition Centre. LEIPZIG BOOK FAIR - second largest book fair in Germany after the Frankfurt Book Fair. Held annually in March. ecame the largest book fair in Germany in 1632 when it topped the fair in Frankfurt am Main in the number of books presented. It remained on top until 1945 when Frankfurt surpassed it to regain the number one spot. LONDON BOOK FAIR - since 1971. 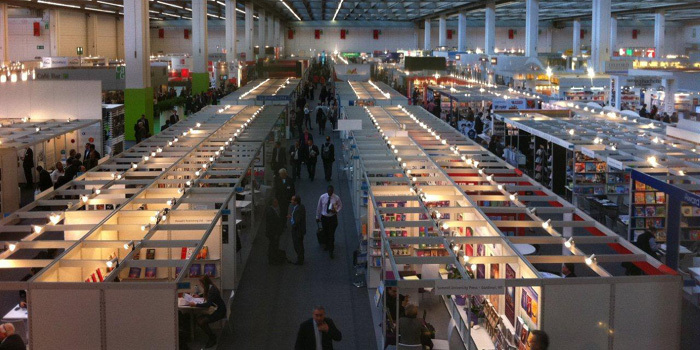 Large book-publishing trade fair held annually, usually in April. Moscow International Book Fair | MIBF - since 1977. The largest and the most representative international book forum in Russia, the most significant annual event for the Russian book industry. NY Art Book Fair - Printed Matter, Inc's annual event that occurs at MoMA PS1 in Long Island City, New York, usually near the end of the month of September. Quebec International Book Fair | Salon international du livre de QuÉbec - The theme "Books without borders", a focus on both young people's literature and international literature. Several authors from around the world will be in attendance and different events will be organized in association with the show. Tokyo International Book Fair | TIBF - since 1993. "On Wednesday, July 2, 2014, "Her Imperial Highness Princess Mako of Japan, as Honorary President, attended the opening of the 21st Tokyo International Book Fair held at the Tokyo Big Sight Convention Center. About 1,530 publishing and related companies from 25 countries around the world gathered at the event in the capital’s Ariake district to make sales pitches and market their books." turin international book fair | Salone Internazionale del Libro di Torino - since 1988. Italy's biggest bookshop. One of the largest book fairs in the world. Held annually in mid-May.